It is true what so many people say about food: it really does bring us together. What I love most is the sharing aspect of this social exercise. Most times, it’s me who is at the stove’s helm, but every now and then, I get to play spectator and watch a friend work magic in their own kitchen. I was invited by my dear friend (who, I should mention, RARELY ever cooks!) to have an authentic home-cooked Mexican meal. So, I was doubly delighted to join in but was even more excited after discovering that we would be making flautas. This Mexican dish comes from my friend’s mother and, like most family recipes, has been adapted but is just one of many variations that can be made. Since learning how to make these wonderful crunchy fried ‘flutes’ of savory goodness, I’ve made them several times over again, each time with different fillings. They are fun to make with friends, but also a perfect way to use up leftovers since only a small amount is needed to fill each flauta. So whether you are planning to entertain a group of friends or just yourself, this recipe does well for just one, or one hundred. Well, okay, maybe not one hundred…unless you are REALLY hungry! 1. Fill a pot with enough water to cover the chicken and potato. Peel the skin off the onion and cut in half, then add it and the potato to the pot of water. Cover and bring to a boil. 2. Once the water reaches a boil, reduce heat down to a simmer. Place the chicken into the pot. Cover and continue to simmer until the chicken is cooked through, about 15-20 minutes. Check the potato by piercing with a knife, remove it when tender (it may finish cooking before the chicken). 3. Remove chicken and potato from pot when cooked. Discard onion. Pull the chicken off the bone and shred the meat into pieces. Peel the skin off and mash the potato. Season both to taste with salt and pepper, then divide each into six portions. 4. Heat about 1/4 inch of oil in a skillet over a medium-high heat. While the oil is heating, roll the chicken and potato tightly into the tortillas. Once the oil is hot, place the flautas into the skillet, seam-side down first, and fry until crisp, about 2 minutes each side. Move to a paper towel-lined plate; allow excess oil to drain off. 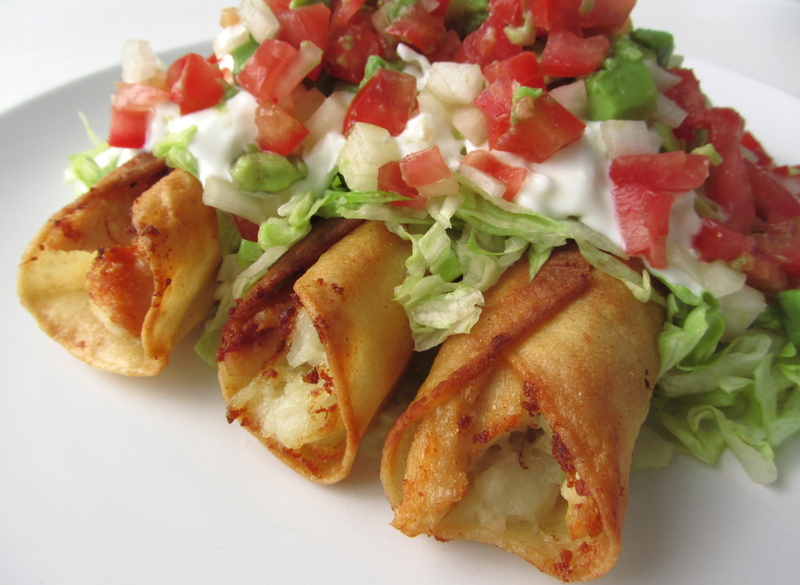 Serve while still hot, topped with sour cream, shredded lettuce, diced tomatoes, and onions. * To test the oil for when it is ready to fry, drop in a piece of tortilla; it should immediately begin to gently sizzle. * Keep the oil level low. If it is too high, too much oil will seep into the flauta and soak into the potato, which can result with them being overly greasy. Wow YUM!! I’d like to try a vegan twist on these maybe using sauteed yellow squash &/or some black beans in place of the chicken….if you don’t mind…These look fabulous! Yes that sounds delicious too! Go for it, would love to hear how they turn out! Your light is so white! How do you do that? It’s all natural! I shoot using diffused, indirect, natural morning light.